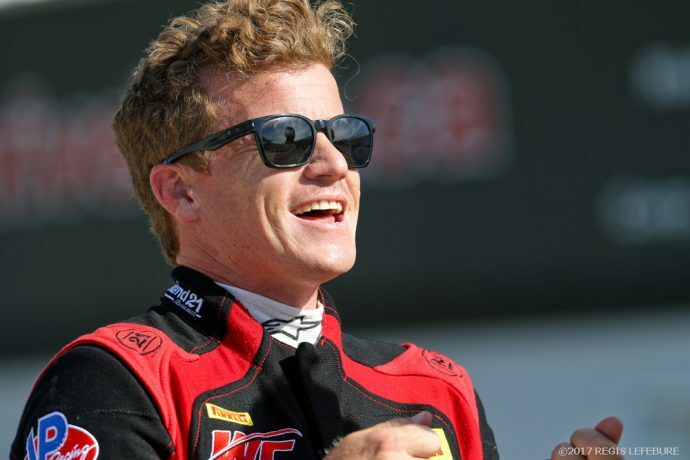 Patrick Long continued his dominance at Canadian Tire Motorsport Park by taking the #58 Wright Motorsport Porsche 911 GT3 R to a new qualifying record, breaking the two-year standing record of Johnny O’Connell, in the Pirelli World Challenge. 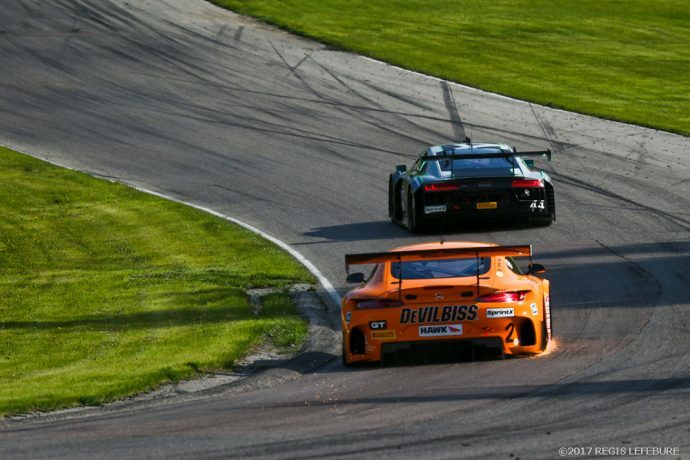 Long, a double winner in GT last year at CTMP, recorded a time of 1:15.221 seconds for an average speed of 117.68 miles per hour, just beating O’Connell’s 2015 record of 1:15.296 (117.568 mph) at the historic 2.458-mile, 10-turn road circuit northeast of Toronto. The top six drivers were driving six different makes in SprintX qualifying. Long won both poles and GT main events last year in his debut with the Wright Motorsports Porsche 911 GT3 R. He’d be partnered with fellow Porsche factory man Jörg Bergmeister with Canadian favorite Daniel Morad and Scotland’s Ryan Dalziel rounding out the front row in the #2 CRP Racing/DeVilbiss Mercedes-AMG GT3. “CTMP has been good to us,” said Long. “If you would have asked me last night if we were going to be on pole today, I wouldn’t have taken that bet. It’s come a different way than last year, with the same outcome. I’m equally as proud but it’s a little sweeter this time because we really had to dig deep today. We tried a lot of things on the car and with the two-driver format, it’s fewer laps around the place for me. Morad, the 27-year-old from Markham, Ont., Canada, was a SprintX GT winner at VIR in his Pirelli World Challenge debut and returned to his home track with another impressive showing, taking second on the SprintX grid Friday with a 1:15.226 (117.67 mph) run. That was just 5 thousands of a second off of Long’s record run. 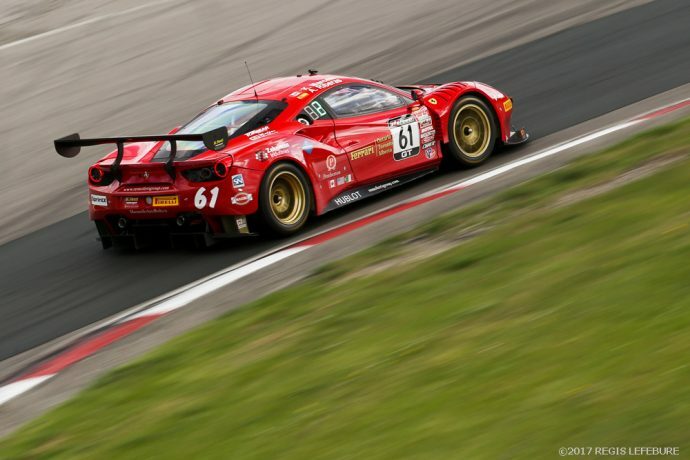 Third on the SprintX 32-car lineup would have been Alex Riberas of Spain, who teamed with Canadian Kyle Marcelli, with the #61 RFerri Motorsport Ferrari 488 GT3 with a 1:15.399 (117.40 mph). Actually, Riberas would have set a new track record Friday but lost the fastest lap when he caused a red flag due to an accident in turn three, the car later withdrawn from the reamainder of the weekend due to the damage caused. Rounding out the top-five in the Pro/Pro division were four-time PWC GT champion O’Connell in the #3 Cadillac Racing Cadillac ATS-V.R. at 1:15.457 (117.31 mph) and Adderly Fong in the #88 Absolute Racing Bentley Continental GT3 at 1:15.764 (116.37 mph). 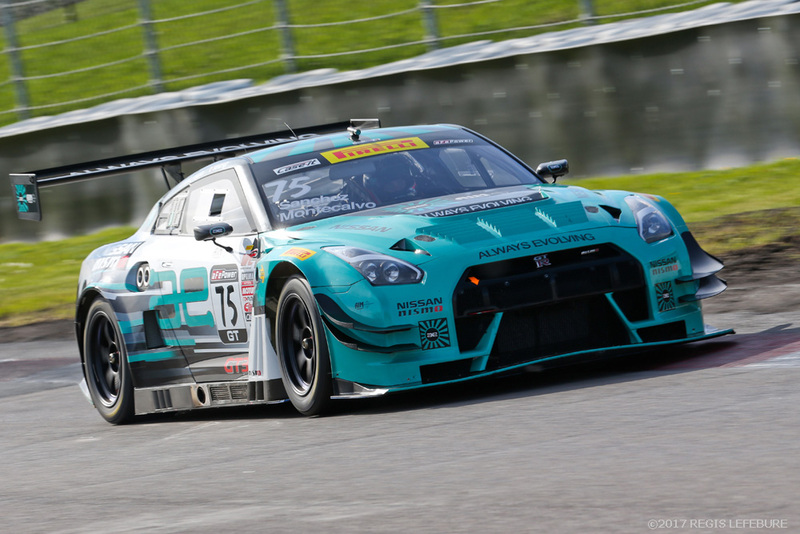 Former GTA series champion Frankie Montecalvo broke his own GTA (Pro/Am) qualifying track record in the #75 Always Evolving/AIM Autosport Nissan GT-R Nismo with a time of 1:15.779 (116.81 mph), just a little quicker than the 2015 mark of 1:15.855 (116.701 mph). Taking second in the Pro/Am qualifying was Michael Schein in the sister car to Long’s, the #16 Wright Motorsports Porsche 911 GT3 R with a 1:16.069 (116.37 mph) followed by Long Beach GTA winner James Sofronas #14 GMG Motorsports Porsche 911 GT3 R at 1:16.837 (115.21 mph). Other pole winners in SprintX include Yuki Harata in the N#55 Dream Racing Lamborghini Huracan in GT Cup Pro/Am at 1:21.338 (208.83 mph); Corey Friedman in the #90 Autometrics Motorsports Porsche 911 GT3 Cup in GT Cup Am/Am at 1:21.856 (108.14 mph); Aristotle Balogh in GTS Am/Am at 1:25.131 (103.98 mph) and George Kurtz in GTS Pro/Am at 1:25.566 (103.45 mph). 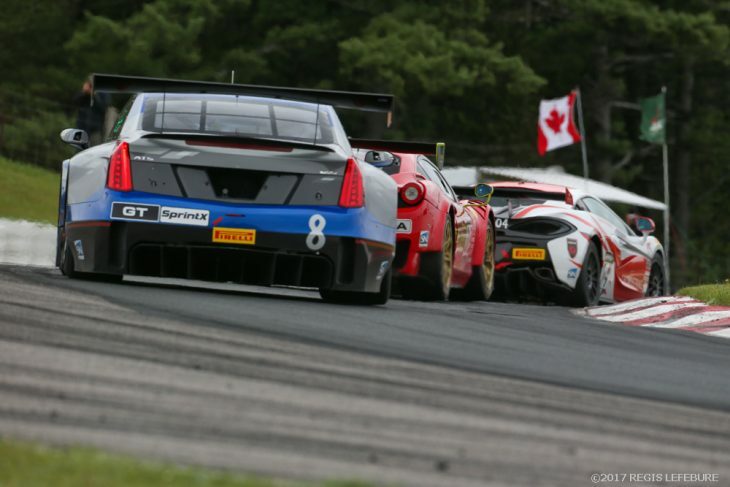 Great timing and hard-charging was the perfect combination Saturday for the Cadillac Racing pair of Michael Cooper and Jordan Taylor in winning the 60-minute SprintX Round 3 of the Pirelli World Challenge Victoria Day Speedfest at Canadian Tire Motorsport Park. 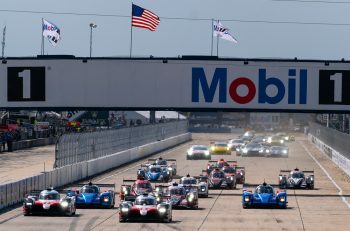 After failing to record a qualifying lap Friday due to a mechanical issue, Cooper started 22nd in the 32-driver field Saturday and charged his way through the SprintX lineup in the #8 Cadillac Racing Cadillac ATS-V.R. sports car before a full course yellow period appeared on lap 24. Most of the leaders had already pitted for their single driver change before the full course caution period including early leader Patrick Long in the #58 Wright Motorsports Porsche 911 GT3 R. Meanwhile, Cooper remained on track and was able to pit his machine under the caution period. While under the caution period, Cooper pitted to give Taylor the #8 on lap 25. The timing was perfect for the Cadillac pair as they were able to stretch their advantage on their challengers. The green flag flew on lap 28 and Taylor opened the margin to some 45 seconds and took the checkered flag with a 46.659-second victory. Long and veteran Jörg Bergmeister record the runner-up position followed by the #3 Cadillac Racing Cadillac ATS-V.R. 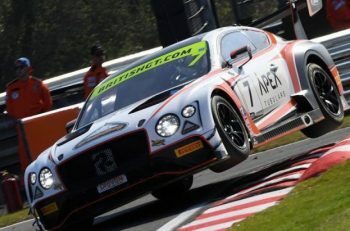 of four-time GT champion Johnny O’Connell and Ricky Taylor, the #88 Absolute Racing Bentley Continental GT3 of Adderly Fong and Vincent Abril and the #4 Magnus Racing Audi R8 LMS of Pierre Kaffer and Spencer Pumpelly. Daniel Morad and Ryan Dalziel drove the # 2 CRP Racing/DeVilbiss Mercedes-AMG GT3 to sixth with seventh place going to the K-PAX Racing duo of Bryan Sellers and Jonny Kane in the #6 K-PAX Racing McLaren 650S. The #14 GMG Motorsports Porsche 911 GT3 R of James Sofronas and Laurens Vanthoor placed eighth overall and won the Pro-Am division over the #16 Wright Motorsports Porsche 911 GT3 R of Michael Schein and Jan Heylen. Other SprintX Round 3 winners included Tyler McQuarrie/Henry Cisneros in the #30 MOMO/NGT Ferrari 458 GT3 in the GT Am/Am class; Yuki Harata/Allesandro Bressan in the #55 Dream Racing Lamborghini Huracan in GT Cup Pro/Am; Corey Friedman/Joe Toussaint in the #90 Autometrics Motorsports Porsche 911 GT3 Cup in GT Cup Am/Am; Aristotle Balogh/Greg Liefooghe in the Stephen Cameron Racing BMW M3 E46 in GTS Am/Am and Ernie Francis Jr./James Pesek in #40 PF Racing Ford Mustang in GTS Pro/Am. Due to a heavy rain storm Sunday afternoon at the Canadian Tire Motorsport Park, Round 4 of the Pirelli World Challenge SprintX series was postponed to a later date on the 2017 PWC schedule. The circuit had standing water around the racing surface including two sections of running water due to the constant rain system traveling through the Ontario area.